You distribute the 48 seeds evenly in the 12 houses, each player should have 24 to begin with. The game starts with 4 stones in each house. Players take turns in playing and each must make a move on each turn. 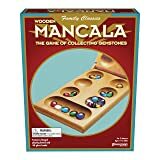 You can move by picking up the stones in any hole on your side of the board and seeding anticlockwise, but each player may only seeds one hole per turn. Where 12 or more seeds are sown on a turn, the original house is skipped, and play continues on the next house. It's forbidden to touch or to point at the stones to count them. You may only count by looking at the stones. A player who has no stones on the opponent's side must (if possible) put stones on the opponent's side. If this isn't possible, all of the stones remaining belong to player whose side they are on. 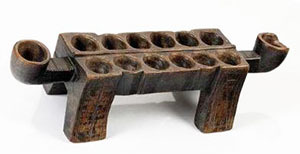 A player can capture stones by landing on the opponent's side of the board where the final hole contains 2 or 3 stones. When the previous hole has also 2 or 3 stones, then they are captured as well. This goes on back to the last hole that finished with 2 or 3 stones or the last hole on the opponent's side. Captured stones are immediately removed from the game. If a move is made that would leave the opponent without seeds, no seeds are captured. The first player who can capture 25 stones is the winner. When both players have captured 24 seeds, it's a draw. When a player is unable to continue play, and his opponent is unable to feed him more seed. Or when an impasse is reached in which neither player can affect another capture, as when two or three pieces are endlessly chasing each other around the board. Both players must agree to stop play, and will split the seeds left evenly, with the player having the most seeds on his side keeping the odd one. Only "1 or 2 stones" are required for capturing instead of "2 or 3". The first player who can capture 21 stones is the winner. A penalty is given for leaving the opponent's side without stones to move with. 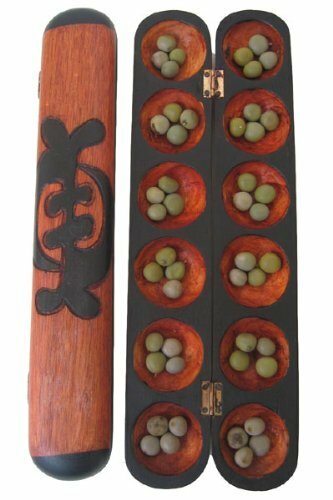 Then the player must forfeit all the remaining stones on the board to the opponent. So, it's very important that players try to have at least one stone on the opponent's side or else they must be sure that the move will win more stones than are lost with this penalty. Players can agree to stop the game when a stalemate sitution arises in the end game (when both players can easily avoid any further losses for ever. 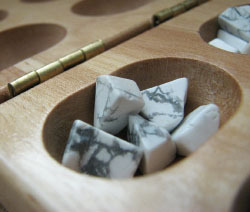 Then the game stops and the captured stones are counted and in this case, the stones on the board are not counted by either player.